Being the largest industry event in Asia for processing and packaging in the food, beverage and pharmaceutical industries, ProPak India welcomed more than 6,000 visitors and 100 exhibitors from all over the country. The 3 day event took place from 30 August – 1 September 2018 at the India Expo Mart, Greater Noida. Russell Finex participated for the first time and was located at Hall.9, Stand 192 with their innovative range of sieving and filtration solutions. 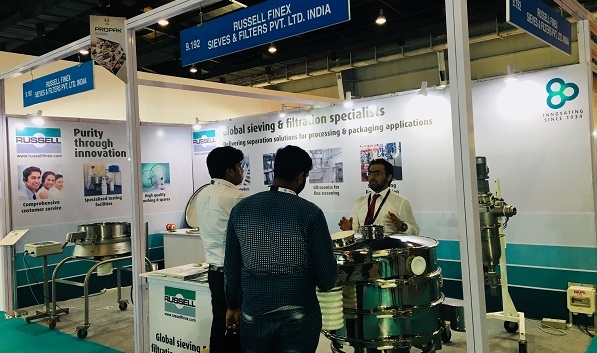 ProPak India proved to be a successful exhibition for Russell Finex, with high quality enquiries and connections being established. Russell Finex presented a range of innovative sieving and filtration solutions for the processing and packaging industries. The Finex Ultima™ : Due to its open frame design for easy cleaning and maintenance, the high-performance vibrating screen is the ideal machine for the food, beverages and pharmaceutical industries. The Finex Ultima™ is designed to provide increased product quality, greater precision and high throughputs for wet and dry applications. The Russell Compact Sieve®: This is a high-capacity safety vibrating sifter which efficiently eliminates oversized contamination from powders and liquid slurries. Its enclosed design eliminates all oversized contamination from food products and increases the product value by ensuring a contamination-free product. The Vibrasonic® Deblinding System – This state-of-the-art ultrasonic vibro sifter has been designed to allow accurate separation of fine powders. This system helps to sieve difficult powders on finer meshes down to 20 microns, which increases screening capacities and product flow, resulting in improved productivity. The Self-Cleaning Russell Eco Filter®: The industrial liquid filtration system removes oversized particles and contamination as small as 10 micron from liquid products. Contact us to learn more about the innovative range of vibro sifters and vibro screens available for the processing and packaging industry.